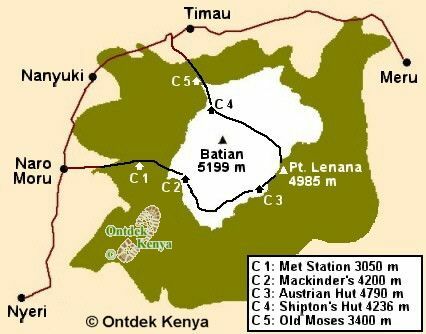 Location: Mount Kenya is situated on the Equator and is, after the Kilimanjaro, the second highest mountain in Africa. Many hikers climb Mount Kenya in preparation of a trek on the Kilimanjaro. Driving time from Nairobi is about 4 hours to one of the several gates. Landscape: climbing Mt. Kenya, you first have to pass through dense tropical forest, followed by a bamboo forest before going above the tree line. Above the tree line there are swampy areas with a lot of small rivers. Here you will find the Giant Lobelia, a high altitude plant. You can also see the Lobelias in the Aberdare National Park and on the Kilimanjaro. The three most used routes for ascending Mt. Kenya are the Naro Moru Route in the west, the Sirimon Route in the north and the Chogoria Route in the east. There are more routes but these are rarely used. To reach the highest peak, Batian (5199 m), you need to be an experienced rock climber. The same goes for the second highest peak: Nelion. The third highest peak, Point Lenana (4985 m) can be reached by fit hikers. Mammals: e.g. elephants, buffaloes, waterbucks, leopards, suni antelopes (= the smallest antelope), giant forest hogs and the rare Bongo antelope. There are plenty of baboons, Black and White Colobus monkeys and Sykes monkeys. Bird species: over 130 species have been recorded in the park. Visitors: Mount Kenya is less visited than the Kilimanjaro because it's "only" the second highest mountain in Africa. 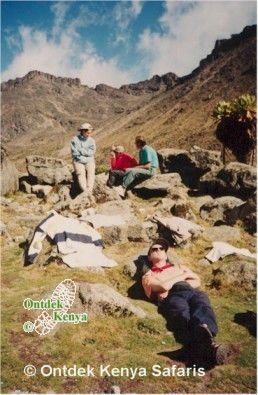 Many travellers who have climbed both mountains in one trip claim Mount Kenya is more difficult than the Kilimanjaro. Mt. Kenya is often climbed by school groups, looking for a challenge, but most of the time there's little human traffic on the mountain. Accommodation: on Mount Kenya you can only overnight in basic mountain huts or camp if you bring your own tent. On the slopes of Mt. Kenya there's the Mountain Lodge (owned by the Serena group) and the Castle Lodge. We usually book our clients in a lodge in the proximity of Mount Kenya (in Nyeri, Naro Moru or Nanyuki). The KWS cottages are a budget-friendly option for who wants to do self-catering.